Kim & Chang has been named "South Korea National Law Firm of the Year" at the Chambers Asia-Pacific Awards 2018. Our firm has won the award five times since 2010 – the most number of wins in Korea – with three of the recognitions awarded in the past five years. This fifth win is a great honor and testament to the well-established reputation of our firm, to the achievements of our professionals, and to the continuing opportunities our clients provide us to help solve some of their most complex business and legal issues. The awards, organized by the internationally renowned legal publication Chambers and Partners, were held at the Eaton House on February 1 in Hong Kong. 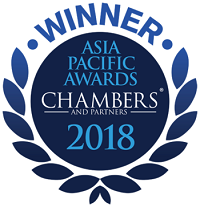 Each year, Chambers recognizes national and international law firms across the Asia-Pacific region for their "outstanding work, impressive strategic growth[,] and excellence in client service" over the past year. In presenting this esteemed award, Chambers describes Kim & Chang as “maintain[ing] a stellar reputation across all practice areas, with no fewer than 19 Band 1 rankings . . . especially well equipped to advise clients on complex cross-border mandates[,] and routinely assists major multinationals and Korean conglomerates with high-profile transactions." Celebrating its 45th year this year, Kim & Chang continues to advise on many of the most complex and groundbreaking transactions in the region.